Wanting to further distill and transform objects in nature, I started a new series which explores the deeper, more spiritual origins of the universe. Some of my questions were how it all began, how our universe evolved over millennia and why it looks as it does. 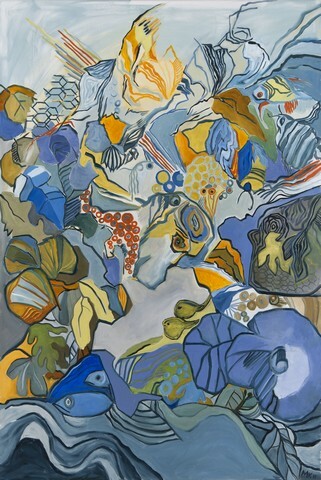 Again using color and the hexagon as symbol, these landscape- oriented Genesis paintings include abstracted images of cold blue, gray dead stones (I ­ III), juxtaposed with the ephemeral, such as hot fire and volatile gasses (IV ­ V), some which include abstracted creature-like swirling shapes in a vortex, VII. 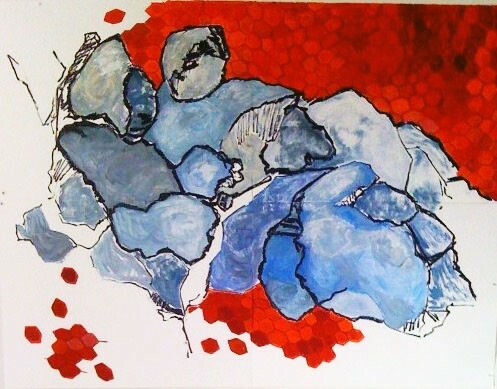 Alternately titled Tohu wa' Bohu, which is Hebrew, for "confusion", Here I was interested in the chaos of an evolving earth at inception, the confluence of physical elements such as earth, fire and water, the aftermath of explosive and dynamic physical forces shaping earth over millennia. 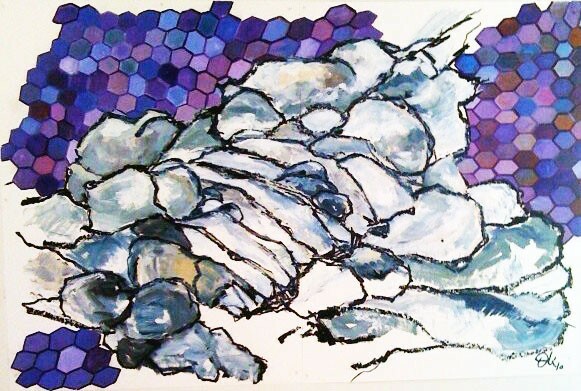 I was interested in painting my notion of the aftermath of earth's evolving, depicting an earth at rest, a phantasmagorical, magical landscape, a new world with plants that surround a portal in the center of the picture inviting the viewer to look into the blank gray space beyond. 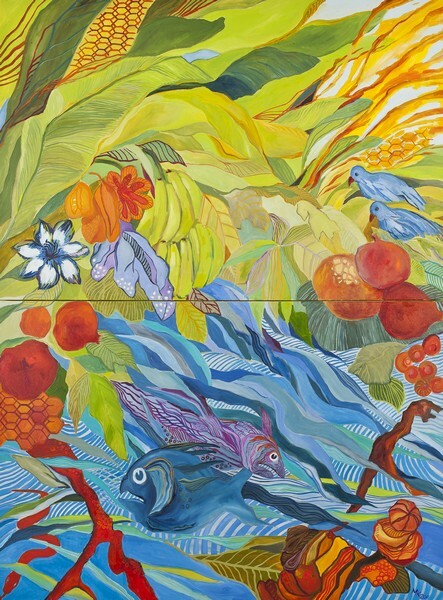 The evolutionary process which produced living creatures to roam the planet provided me with spiritual and metaphorical associations and connections which I incorporated in this painting. The mysteries of the universe continue to inspire, confound and inform. MK 2010, Oil on Paper, 76" x 100"
MK 2010, Oil on Paper, 50" x 72"
MK 2010, Oil on Paper, 50" x 38"
MK 2010, Oil on Canvas, 48" x 48"
MK 2011, Oil on Canvas, 72" x 48"
MK 2011, Oil on Canvas, 72" x 96"
MK 2011, Diptych-Oil on Canvas, 96" x 72"